The National Register of Historic Places has helped encourage the preservation, rehabilitation, and restoration of urban neighborhoods and small towns across the United States since the passage of the National Historic Preservation Act of 1966. However, the benefits that are currently extended to neighborhoods and small towns will, because of vague evaluation criteria, become increasingly available for use by sprawling Post-War suburban subdivisions like Levittown, New York as they begin to reach the 50 year mark. This article aims to establish the importance of differentiating from sprawl and other development patterns with criteria-based distinctions that should be used in developing strategies to address the issues associated with sprawl. The aim of this article is to galvanize the general public and policy-makers in every level of government to chart a new course for future development and investing in our existing places through the use of studies, reports, peer-reviewed articles, and other scholarly literature that establishes the problem and possible solutions to the issue of “Historic Sprawl”. Listing on the register encourages “preservation of historic resources by documenting a property’s historic significance,” provides “opportunities for specific preservation incentives”, and gains a district access to “possible State tax benefit and grant opportunities,” “involvement from the Advisory Council on Historic Preservation,” and “information on the care and maintenance of your historic property.” The specific preservation incentives may include Federal preservation grants for planning and rehabilitation, Federal investment tax credits, Preservation easements to nonprofit organizations, and exceptions from complying with the International Building Code. To say the least, there are significant benefits to being listed on the National Register of Historic Places. An example of the benefits of being listed on the National Register is the neighborhood of Newhallville (Fig. 1), which is located in New Haven, CT. The Winchester Repeating Arms Company established a factory in the northern section of New Haven along the Northampton Rail Road in the mid-19th Century and quickly became the city’s “largest employer”. As a result of the growing factory, developers came into the area north of the factory and began subdividing land and building worker housing along trolley lines. During World War 1, the factory massively expanded in order to meet the demand of the Federal government’s weaponry contracts, which helped turn Newhallville into a dense urban neighborhood with a thick network of commercial establishments. However, the company’s hiring went into steady decline after World War 2, and by the early 1980s had abandoned many of its buildings. As a result of the factory’s reduced role in employing Newhallville residents, the neighborhood saw a steep rise in crime rates, shrinking population, drop in property values, loss of small businesses, and the decay of its building stock. Today, Newhallville is largely characterized as a speculatively-built working class neighborhood with a building stock that primary dates to the early 20th Century and is in need of serious investment. Since 1987, when the neighborhood was nominated for listing, many preservation projects have been carried out to positive effect. Among these initiatives are numerous rehabilitation and restoration projects like the façade restoration of 335 West Division Street, and the rehabilitation of part of the now-vacant Winchester Repeating Arms factory complex. Neighborhood Housing Services (NHS) of New Haven – the non-profit affordable housing developer that completed the façade restoration on West Division Street (Figure 2) – has been active in Newhallville for many years acquiring distressed properties, rehabilitating them, and selling them to low-to-moderate income families. Because of Newhallville’s listing on the National Register, NHS is able to use State preservation grants to restore the facades of their rehabilitation projects. Access to these various kinds of tax credits and grants has enabled NHS to rehabilitate more than 235 houses, many of which are owner-occupied multifamily homes, in the City of New Haven. Encouraging home ownership in Newhallville has helped to stabilize the neighborhood by bringing in invested families that view property maintenance as a responsibility of homeownership and civic duty to the neighborhood, which helps raise property values, induce further investment, and create a sense of safety in the neighborhood. 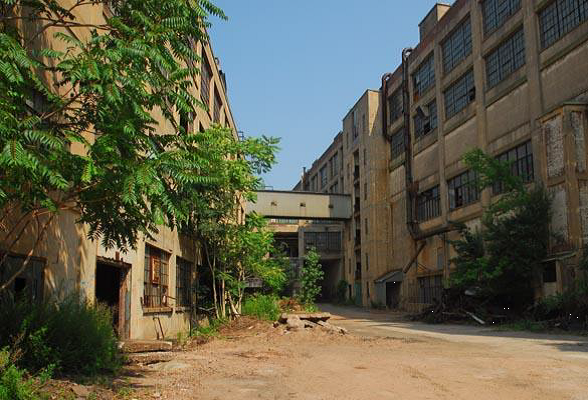 The rehabilitation of part of the abandoned Winchester Repeating Arms factory complex (Figures 3 & 4) was also aided by State preservation grants and tax credits. 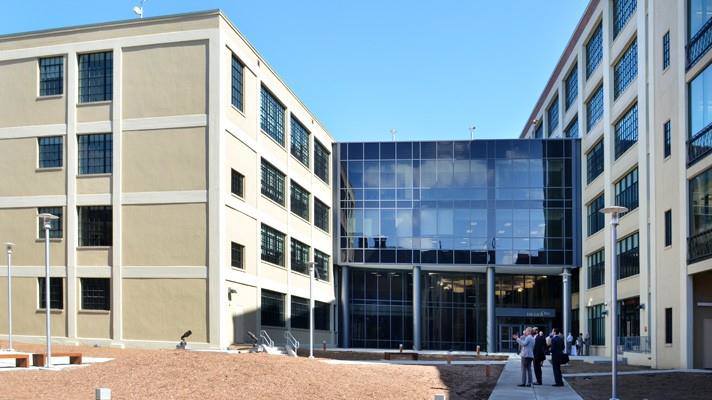 Higher One, a private company that provides financial services for college students, has been growing rapidly and was in need of more office space, which was provided by Winstanley Enterprises, a private development company that specializes in office buildings. Having opened their new headquarters in March of 2012, Higher One may be on its way to helping Newhallville back onto its feet. The preservation initiatives in Newhallville are indicative of the types of benefits gained from being listed on the National Register of Historic Places. These benefits have helped to rejuvenate urban neighborhoods and small towns across the country as well as preserve the unique character of the historic places that are at least 50 years old. However, it is possible to foresee a great shift in how these resources are being used in the near future with the increasing number of Post-World War 2 suburban subdivisions that are meeting the criteria for listing on the National Register. Neighborhoods like Newhallville, which seem unquestionably worthy of historic status and preservation today, actually share many characteristics with the type of Post-World War 2 suburban sprawl that is embodied in subdivisions like Levittown, New York (Figure 5). According to the existing standards of eligibility for listing on the National Register that provide access to benefits, nearly any suburban subdivision that is at least 50 years old could potentially be listed on the National Register. Like Levittown and other early automobile suburbs of the 1950s, Newhallville is made up of a building stock that was built primarily with the platform framing method, standardized wood components, mass produced construction materials, and by builders that used floor plan templates from catalogues. Furthermore, many of the houses in Newhallville have been significantly altered through building additions, renovations, or both, which has drastically changed the appearance of many of the buildings within the Historic District. Additionally, several residential buildings in Newhallville were modified into commercial storefronts before the passage of zoning, which did not happen in New Haven until 1926 – long after much of Newhallville was developed. As a result, it’s quite possible that many Post-War suburbs are more substantially intact than the older urban neighborhoods and small towns that are currently listed on the National Register. 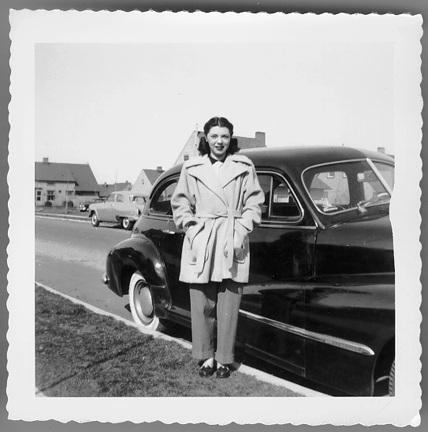 Another characteristic that places like Newhallville and Levittown share is that they both are culturally significant in their embodiment of the social values from their specific time periods. Newhallville is indicative of the speculative development of industrial worker housing in the early 20th Century by entrepreneurial capitalists. 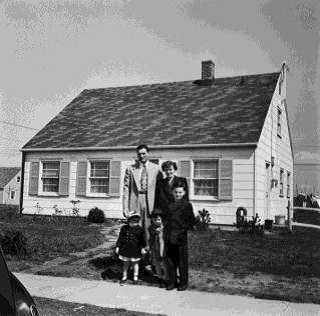 And Levittown is representative of a desire to provide affordable, single family homes set in spacious and green surroundings to returning G.I.s in the immediate Post-War era (Figures 6 & 7). However, there are also some significant differences between places like Newhallville and Levittown, but those differences are, unfortunately, not criteria used for evaluating a Historic District nomination. Therefore, it is likely that places like Levittown will become increasingly eligible for listing on the National Register of Historic Places in the years to come, assuming that the standards remain the same. If sprawling Post-War suburban subdivisions like Levittown do become listed on the National Register, as they certainly could be under the current standards, then the result will be to preserve suburban sprawl. Like the projects in Newhallville that have kept the neighborhood and its infrastructure functioning much in the same way that it has for the last 100 years, similar preservation projects in Post-War suburbs could lead to their preservation in their current condition. While there are many similarities between older urban neighborhoods and Post-War suburbs that make them both eligible for listing on the National Register, there are also important differences between them that should be considered when evaluating Post-War suburbs. An important difference between Newhallville and Levittown is that Newhallville is a multimodal, mixed use, and diverse neighborhood, while Levittown is an automobile-oriented, highly standardized, single use, and socially restrictive subdivision. Newhallville – with its mix of housing types, employment options, transit connections, pedestrian infrastructure, social organizations, and commercial establishments – embodies many of our contemporary social values and planning ideals, which make it resilient to market shifts, economic turndowns and changing market demands. Levittown, on the other hand, is inherently a socially restrictive place because of its lack of multimodal infrastructure, mixed uses, and housing diversity, which make it susceptible to changing market forces. As a study from 2009 on the relationship between housing location, organization, and public health found, development patterns that require driving due to a lack of adequate transportation options and promote low air quality as a result of congestion contribute to childhood obesity and asthma. Another study from 2006 conducted for the Center for Neighborhood Technology found that blue collar working families living in automobile-dependent suburbs pay more for their housing and transportation than similar families who live in higher taxed central locations but also have access to transit. And while suburbs made up of only single family homes are often justified by homebuilders associations, developers, and the media for meeting the demand of the American public, a 2009 study found that people prefer to be able to downsize their house while remaining in one area, which is possible in older neighborhoods, but not in newer suburbs. Giving these sprawling suburban areas the benefits of tax credits and planning grants in order to preserve their historic character, which they are entitled to under existing standards, would also preserve all these negative social, environmental, and health-related issues. Therefore, it becomes necessary to make clear criteria-based distinctions between sprawl and other development patterns like neighborhoods and small towns in order to prevent the preservation of obesity, social dysfunction, and environmental degradation. The first step towards preventing the preservation of Post-War suburbs in their current condition is to establish a set of criteria-based distinctions between sprawl and other development patterns. The next is to develop an expanded set of preservation standards that are either 1) used in the evaluation of Historic District nominations for the purposes of excluding sprawl or 2) aimed at encouraging the type of preservation work that would address deficient characteristics of suburban sprawl should a subdivision like Levittown or strip mall seek listing on the National Register. These types of distinctions become important when establishing a clear set of standards to be used in evaluating different development patterns, especially when it comes to potential listing on a National Register. Another key component to developing standards for evaluating sprawl is to establish clear criteria that are quantifiable and measurable. These criteria might be based on something like an environmental impact study, which would record driving habits, measure amounts of asphalt, study storm water drainage, etc. in order to determine the impact of certain types of development patterns and use that as a way of making distinctions between places. It is also important to, as Richard Peiser – author of Decomposing Urban Sprawl – points out, “distinguish those aspects associated with sprawl that are truly bad from those that are not”, which could be determined by environmental impact studies, surveys, and interviews. Once clear standards are in place for evaluating different types of development patterns, they can be used to either prevent certain types of development patterns – say sprawl – from being eligible for listing on the National Register of Historic Places, since they currently are not. Alternatively, those standards could still allow for sprawl developments that are at least 50 years old to be listed on the National Register but make them subject to a different set of requirements in order to receive benefits. By making sprawl development ineligible for listing on the National Register, the legitimacy of that development pattern is correctly denied and it makes a clear statement to our national values, which should encourage accessibility, affordability, and diversity in how people live. Doing so would also mean that the Secretary of the Interior’s standards do not have to be amended and that funding can be reserved for neighborhoods like Newhallville, which would continue their ongoing preservation work. However, this approach also would not encourage the reformation of sprawl into a more equitable, accessible, and affordable living arrangement and development pattern – allowing it to continue in its current condition. Reforming sprawl through preservation initiatives would involve defining sprawl’s characteristics, establishing a new set of standards for rehabilitation of sprawl buildings, and encouraging these types of projects through various government policies. This approach is more difficult and initially costly, but it is the proactive approach that may lead to the reformation of a deficient development pattern into a more suitable setting for all people. New Secretary of the Interior’s standards for reformation of sprawl would look very much like suburban retrofitting initiatives such as those outlined by Ellen Dunham-Jones and June Williamson in Retrofitting Suburbia: Urban Design Solutions for Redesigning Suburbs. The book showcases various ways to retrofit suburban sprawl in order to become more sustainable, including the integration of higher density living, agriculture, and multimodal transportation planning. Examples of projects include retrofitting suburban shopping malls, strip developments, and housing subdivisions (Figures 9 & 10). The authors of Retrofitting Suburbia even have a chapter that is dedicated to design solutions, which include higher density housing development, specifically for Levittown, New York. Other guides for redesigning suburbs include Galina Tachieva’s Sprawl Repair Manual; Andres Duany, Jeff Speck and Mike Lydon’s The Smart Growth Manual; and Environa Studio’s Reincarnated McMansion. However, for these projects to be relevant from a historic preservation perspective, some defining characteristics must be retained in order to preserve the aesthetic qualities that many people associate with single family housing subdivisions and justify the use of preservation grants and tax credits. If retrofitting suburbia only involved demolition and other inherent changes to the landscape, then it wouldn’t be a preservation technique. Therefore, the projects must retain those important defining characteristics that, as Richard Peiser pointed out, are not bad, which include the associations that people have with homeownership and the preference of the American public for single family houses. This can be accomplished by designing multifamily houses that appear to be single family or by including a range of different types of housing (Figure 11). The goal of preservation-oriented retrofit projects for sprawl should be the retention of as many of the “good” defining characteristics of the development pattern while promoting mixed use buildings, multimodal transportation planning, and the inclusion of diverse building typologies. Additionally, these initiatives should improve accessibility to, from, and around the district in order to decrease the environmental, social, and health-related impacts of the development. These retrofitting projects should also reduce the demand for future sprawl development by encouraging denser development within the subdivision. And finally, these initiatives should promote investment in central urban areas by encouraging the appropriate deconstruction of foreclosed suburban buildings for reconstitution on vacant urban lots that already have infrastructure in place, which would also free up land in suburbs for agricultural uses. This massive project demands Federal and State changes to transportation, land-use , development, and tax policies; it demands zoning reform at the local level; and it requires that various government agencies, departments, law-makers, and decision-making bodies support this initiative. One major issue today that concerns efforts similar to those outlined in this paper is that there is a lack of coordination between government agencies and there are conflicting policies that result in wasted funds and contradictory values. For instance, State tax credits in Connecticut help to rejuvenate urban neighborhoods like Newhallville and homebuyer’s programs like Yale University’s help retain the city’s population, but those investments pale in comparison to other subsidies that encourage sprawl development. Expanding on coordination efforts between Federal agencies like the Environmental Protection Agency, Housing and Urban Development department, and the Department of Transportation will be essential to making meaningful investments in future developments in the United States, which must include reforming suburban sprawl. By anticipating the advent of suburban sprawl becoming increasingly eligible for listing on the National Register of Historic Places, policy changes can be enacted that will incentivize the retrofitting of this deficient, inefficient, and polluting development pattern. Land-use, taxing, and development policies can be changed from their current bias towards sprawl-oriented development in order to prevent future sprawl from being developed. This will help to preserve landscapes and reserve land for other purposes like agriculture. Next, policies changes, such as adopting new local zoning ordinances, can enable the retrofitting of suburbia. And finally, incentives that encourage the retrofitting of sprawling suburbs can be enacted through initiatives like the National Register of Historic Places, which can provide benefits to communities that enable them to retrofit their subdivision while preserving its “good” characteristics. By taking a proactive approach sooner rather than later, the prevention of preserving sprawl in its current state can be realized. The preservation movement – in coordination with environmentalists, developers, medical physicians, and others – can encourage law-makers to pass legislation to amend the Secretary of the Interior’s standards to include suburban retrofitting guidelines that outline appropriate initiatives to be funded by tax credits and planning grants at both the State and Federal level. In coordination with land-use, zoning, tax, and development policy reforms that discourage new suburban sprawl developments, historic preservation funding sources can encourage the retrofitting of sprawl into a more sustainable, accessible, affordable, and attractive living arrangement. Following through with these initiatives would present a very different future from the one we are currently headed towards, which will be defined by continued environmental degradation, social dysfunction, and economic inequality. This new future might be characterized by children being able to walk to school, families not getting priced out of neighborhoods due to transportation costs, safer roads, healthier people, a more empathetic population, and many other positive changes. It takes a concerted effort to guide and write policy that will get us to that point, but it is not beyond the means of the American public nor those that represent the people.